With the Asian Tsunami in 2004, and Hurricane Katrina the following year, the destructive power of the sea moved to the forefront of the collective psyche. If the lingering images of the devastation in Southeast Asia, and in New Orleans and along the Gulf Coast, aren’t a vivid enough reminder, Hollywood has provided numerous fictional examples; New York City alone has been destroyed by the sea in such films as When Worlds Collide (1951), Deep Impact (1998) and The Day After Tomorrow (2004). While water-induced destruction seems far removed from daily life on the streets and avenues of New York City, the effects of climate change have merited the attention of local engineers, architects and landscape architects seeking ways of mitigating damage from sea level rise, flooding and storm surges. 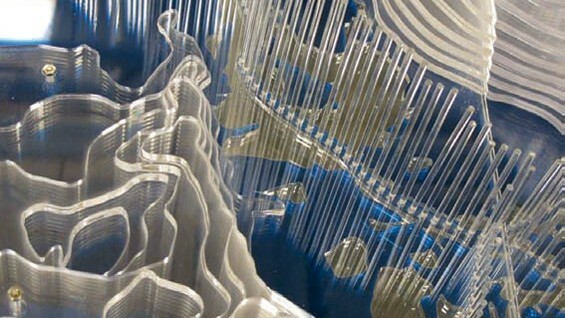 From March through October 2010, an exhibition called “Rising Currents: Projects for New York’s Waterfront” was on display at the Museum of Modern Art in New York City. Rising Currents was the culmination—along with a companion book called On the Water: Palisade Bay—of the long time research of Cooper Union graduate Catherine Seavitt in collaboration with her husband, structural engineer Guy Nordenson, and Adam Yarinsky, principal and co-founder of Architecture Research Office. Seavitt’s interest in the relationship between land and water can be traced to 1997, when, as a recipient of the Rome Prize in Architecture, she spent a year examining the relationship between Rome, the Tiber River and the Tyrrhenian Sea. “I studied both the ancient and the Mussolinian ‘modern’ connections of Rome to the sea,” she says. “I got more and more fascinated with the Tiber River itself, its wandering route, and its urban course in the city of Rome, which got walled off in the late 19th century after some devastating floods. This has essentially severed the river from the city.” Seavitt’s year in Rome took her some 4,500 miles from her hometown of Detroit, MI, where she was born in 1969. The daughter of mathematicians, she was raised in what is now the historic Boston-Edison neighborhood of the city. She was introduced to architecture as a profession in a high school drafting class, where she learned about hidden lines and line weights. After high school Seavitt attended the University of Michigan, majoring in dance before being admitted to the school’s pre-architecture program. It was in her junior year studio that she heard about a school in New York City—The Cooper Union. In 1991, as a third-year transfer student, Seavitt undertook an analysis of Henri Labrouste’s Bibliothèque Sainte-Geneviève in Paris under Richard Henderson.The next semester, she developed her drawing skills in a studio with Tony Candido. The following year, she studied under Peter Eisenman, who she describes as one of the finest teachers of architecture she’s known, and Raimund Abraham, who she describes as perhaps her most influential teacher. After graduating from Cooper Union in 1994, Seavitt would go on to earn a Master of Architecture from Princeton and work in the Paris office of Peter Rice, RFR, and the New York office of Pei Cobb Freed and Partners. After teaching at Cooper Union for a year, and seeking to develop her “inner landscape architect,” Seavitt received a Fulbright grant to study the work of the Brazilian landscape architect Roberto Burle Marx. When she returned to New York in 2002, Seavitt opened her own office, Catherine Seavitt Studio, and resumed teaching at Cooper Union, a position she would hold through 2006. Today, she teaches at Princeton and City College (where she received a bachelor’s in landscape architecture in 2007) and lives on Manhattan’s Upper East Side with her husband and two sons, Sébastien, 5, and Pierre, 3. Reflecting on her work in Rome, Seavitt thought about how responses to flooding could transform a city—for better or worse. She says that many hard infrastructural responses simply don’t work, are environmentally irresponsible, and are quickly outdated. “Responding to this,” she says, “we developed the concept of soft infrastructure, which involves incremental, multiple and iterative strategies operating at the fluid boundary of land and water to absorb flooding and attenuate wave energy. “It’s very different from the hard infrastructure of an impervious sea wall or storm surge barrier, which is a decisive limit between water and land.We like to think in terms of gradient, slope, crenellated edges and absorbent surfaces, about reducing wave energy, instead of attempting to eliminate flooding entirely. This can be done with reefs, artificial archipelagos and wetlands.” Also interested in using the bay as a way of producing clean energy, the team proposed windmills, tidal turbines and areas of algae aquaculture to produce green bio fuel. 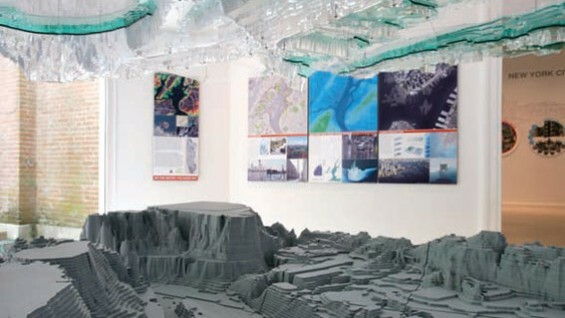 For the Rising Currents exhibition, four teams of young architects, landscape architects and engineers with at least ten years of experience were selected from a pool nominated by academics, deans and prominent practitioners. Yarinksy’s firm, Architecture Research Office, joined as a fifth team. Over eight weeks, each group produced detailed projects for five sites around the bay. 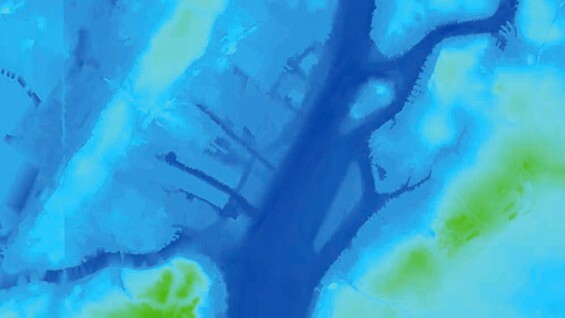 For Lower Manhattan, for instance, the design plan includes elevating the coastline by “incorporating the existing vertical seawalls into a new topography that surmounts them;” a matrix of islands formed from dredged material that create a reef-like barrier to break up waves before they reach land; and breakwater towers adjacent to ferry terminals and navigation lanes.